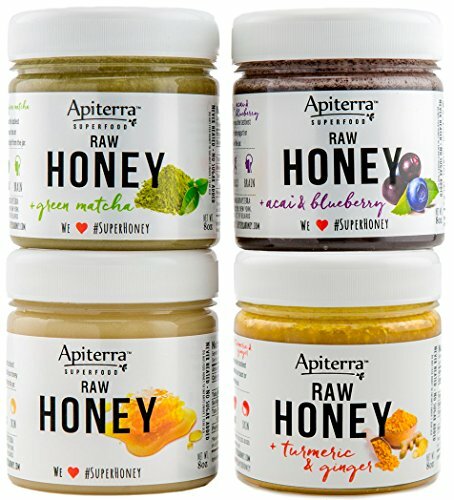 Welcome to Apiterra, the first artisan company in the US to produce all-natural, RAW HONEY-BASED SUPERFOODS for HEALTHY BREAKFAST. Do you like honey spread as much as we? We love honey and we know you'll fall in love too after tasting our incredibly delicious, unique and raw honey product. We thrive on our passion for tasty healthy products that use the cleanest ingredients. We aim to make honey a staple in every household, promoting a healthy lifestyle for each person with each of our delicious, unique flavors. Our raw honey gift set has not been heated, pasteurized or processed in any way. It is alkaline-forming food that contains natural vitamins, enzymes, powerful antioxidants and other important natural nutrients. One spoon every day boosts your immune system, improves digestion and detoxes the whole body. Just 100% INNOCENT PURE, RAW HONEY with SUPERFOODS for BREAKFAST. DON'T MISS the chance to try incredible breakfast honey set with Superfoods! If you have any questions about this product by Apiterra, contact us by completing and submitting the form below. If you are looking for a specif part number, please include it with your message. Date Sugar Powder, 4 Pounds (Four lbs), All Natural, Non-GMO, Healthy Sugar Alternative! BULK.